The Tideflex Series 37-G is a special adaptation of the Series 37. The 37-G can be completely inserted into a pipe which effectively gives it a zero face to face dimension. The outside diameter of the 37-G’s cuff is fabricated to precisely match the inside diameter of the pipe, providing a press-fit. 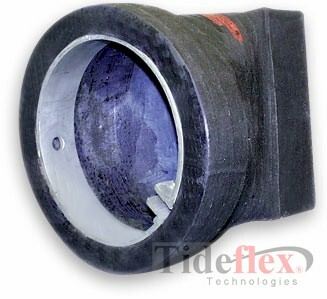 The valve is supplied with an internal expansion clamp to provide compression between the valve and pipe ID. The 37G can even be fabricated for elliptical or out of round pipe (consult factory for special fabrications). As with the Series 37 the “bill” does not flare and the headloss of the 37-G is higher than other styles of Tideflex. The 37-G is predominantly used in gravity-driven outfall pipes and in manholes and vaults where the valve is inserted into the effluent pipe and compressed to the pipe ID with the expansion clamp. The 37-G can be inserted into the end of a pipe, but access to clamp should be from upstream of the valve, not thru the “bill” of the valve. For those applications where there is no access to the upstream side of the valve, the 37-G Thimble Insert is the solution.